As I headed over to the West Side of Manhattan, I wasn’t sure exactly what to expect. I’d been promised a time machine. I’d been told to use the password “arcade” at the door. The building was big, empty and dark. The guard behind the desk looked up, and raised an eyebrow, as if to say, “So?” I said the password, and he pointed to the elevator bank. “Third floor,” he whispered. OK, this was kind of weird. But it was the scale model of Ben’s Chili Bowl in Washington D.C. that called my name. I’d found the time machine, in the “Traveling While Black” VR documentary. A view of how African Americans have been treated while traveling won an Academy Award this year for the film “Green Book.” And my friend and fellow TED resident Evita Robinson’s TED Talk “Reclaiming the Globe” brought the issue to light by discussing her modern-day experiences. So I wasn’t entirely sure what a trip in a time machine would add to my understanding. Then I put on the VR goggles. It was most certainly a time machine. Director Roger Ross Williams puts you in a booth in the Chili Bowl and lets you travel through the decades. I sat fact to face with people engaging in the battle that goes on today — from the restaurant’s owner Virginia Ali to civil rights leader Courtland Cox to Samaria Rice, the mother of Tamir Rice, the teenager shot by Cleveland police in 2014. After 20 minutes, I was back. But things had changed for me. This new kind of immersive storytelling gives documentary directors an entirely new canvas. Director Williams was able to mix historic context with a modern-day story, making it hard to ignore the impact of the past on today’s growing tide of racism, anti-Semitism, and anti-Muslim hate. “You can really experience the pain of the people talking to you and telling you their stories. You can see into their faces in a way that doesn’t let you look away. That’s something only VR can give you,” says Williams. And for me, the immersion and the powerful reality of being in the story broke the fourth wall objectivity that can leave some documentaries engaging, but distant. The entire experience is the creation, or rather curation, of Charlie Melcher, the founder and creative driver behind the Future of Storytelling conference. 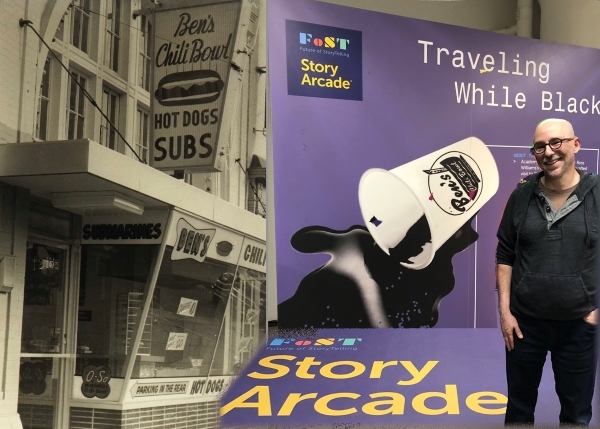 “Coming to the Story Arcade is going to give you a glimpse into the future,” said Melcher. Indeed, for me, he was certainly right. “Traveling While Black” was produced by Felix & Paul Studios in partnership with the New York Times and isalso available in the Oculus Store for Oculus Rift, Oculus Go and Gear VR. Check out the Future of Storytelling pop-up here. Neel Patel, a freelance journalist who writes about technology, can relate to this fear. Patel wrote the essay, What It’s Like to Fly When the TSA Profiles You for Thrillist after he noticed an increase in his stress and anxiety when he passed through airports shortly after Trump was elected. Patel, who is of Indian descent, says he wrote the Thrillist piece because he wanted to give a glimpse into what it’s like for him when he travels to people who aren’t minorities and haven’t been on the receiving end of racial profiling. “I can’t leave things up to chance and leave room for error. I have to keep my emotions and facial expressions in check and know the rules much more rigorously than others because I know I’m going to deal with experiences that cause me to lose time as well as being outright humiliating and debasing,” added Patel. Patel echos Ross Williams sentiment about the importance of experiencing something you can’t escape. He said he believes that giving people the opportunity to step into an experience like Traveling While Black that’s entirely foreign to them can only serve to help learn empathy and understand more closely the choices he and others have to make, even for a simple thing like flying. Patel believes VR can be very useful in this experiential storytelling, but it has to be done well. “If you think of technology as key to education, then you can approach it as a tool that can teach and can impart new insight, new wisdom, and new empathy,” added Patel.